(Nanowerk News) Churning raw milk sufficiently creates butter. Squirting lemon juice coagulates it into curd. These two phenomena are not as straightforward as they sound on the molecular level. When milk is churned, the fat molecules in it come closer to form aggregates. Lemon juice increases milk’s acidity and creates similar molecular lumps. Yet butter and curd are not solids because in both cases, the aggregated molecules still maintain consistent distances from each other, behaving as if they are part of a liquid. There are similar liquids, both natural and man-made, where molecules pack together like a solid in certain localized regions of the bulk material. Gels and shaving cream are industrially crafted examples. Recipes for creating such materials exist, but scientists do not always understand why they work. Creating new types of functional materials from existing ones, therefore, depends on educated guesses and involves trial and error. Joint research by the Okinawa Institute of Science and Technology Graduate University (OIST) and the Los Alamos National Laboratory has discovered a way to predict the emerging structures and bulk properties of new materials of this kind as they are crafted from variations of existing recipes. The researchers published their findings in Soft Matter ("A minimal description of morphological hierarchy in two-dimensional aggregates "). The discovery has significant technological implications in manufacturing new functional materials. The changing color is a visualization of changing experimental conditions that give rise to the different bulk properties of a liquid, as aggregates are formed in different degrees. Just as a cook working with a known recipe alters the flavor of a dish by varying the amount of its constituents, adding new ones, and changing the amount of cooking time, experimental scientists do similar things with materials to try and discover fundamental laws. They crowd control molecules within a given space under different conditions. Adding a new constituent, stirring the pot or changing the temperature influences how much molecules can move around and the closest they can come to each other, by altering the attractive and repulsive forces operating at the molecular level. Only in specific cases are changes to the material irreversible. The OIST researchers have found the golden combination among these attractive and repulsive forces, that is, they have uncovered a previously unknown mathematical interrelationship among them that allows the structure and bulk properties of the resulting material to be predicted. "What we found was a simple ratio that weighs the overall attractive forces against the overall repulsive forces in a material. Its value, under different experimental conditions, corresponds with the degree of molecular aggregation. From the existing mathematical tangles, the simplicity that emerged surprised us," said Tamoghna Das, the paper’s lead author and a postdoctoral scholar in the OIST Collective Interactions Unit. In real life bulk systems, it is the degree of molecular aggregation that defines the resulting material’s eventual properties. 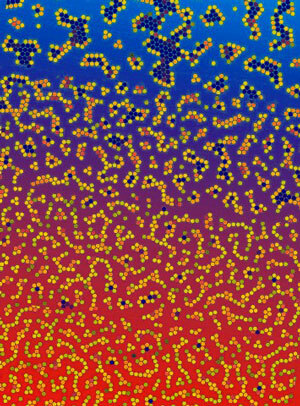 The OIST researchers ran 2D simulations involving tens of thousands of particles. To govern the simulated particles, they fed existing equations of intermolecular crowd control into their system and plugged in values that would lead to the formation of aggregates. They tinkered with their numbers so that aggregation occurred in differing degrees. Variables like external temperature and overall density of distribution of the resulting aggregates were kept constant for each set of values. While searching for a relationship, between the changing values of the parameters controlling their simulation and the changing degrees of aggregation, they made the important discovery. Their findings can easily be adapted to three dimensions, in accord with real life situations. The discovery will allow experimentalists to bypass mathematical details of reorganizations occurring at the molecular level in these special materials. It will allow them to predict their emergent bulk properties using the minimum possible information, about external conditions manipulable via experiment. In pragmatic terms, this means it is not always necessary to know why a whole is greater than the sum of its parts. Practical applications aside, this is also a major scientific advance considering the same mathematical parameters have been used to describe intermolecular forces inside materials since the turn of the 19th century.